Home / DDS / Entertainment / Lolit Solis / Lolit Solis Supports Duterte / Pres. 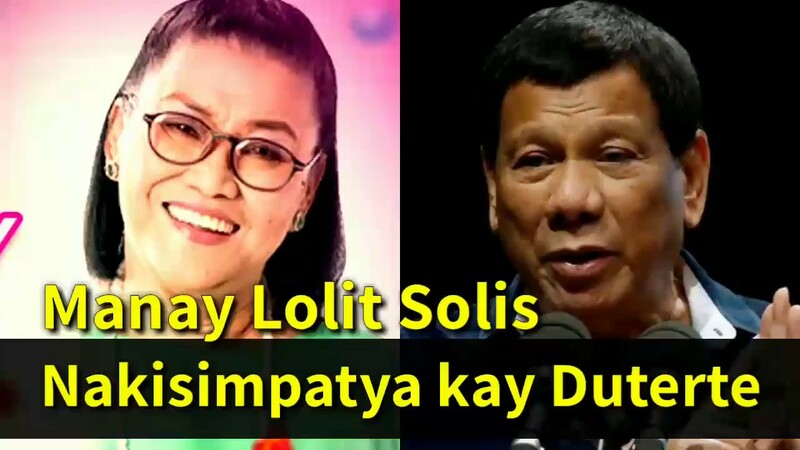 Rody Duterte / War on Drugs / Lolit Solis Supports Pres. Duterte's War on Drugs: "Mawala Lang ang Drugs Sure Ako Tatahimik na Tayo"
Lolit Solis Supports Pres. Duterte's War on Drugs: "Mawala Lang ang Drugs Sure Ako Tatahimik na Tayo"
Veteran talent manager Lolit Solis supported Pres. Rody Duterte's War on Drugs as she enumerated the reasons why Filipinos are luckier as compared to the citiziens of other countries. Lolit Solis stated that "Mawala lang ang drugs sure ako tatahimik na tayo." According to Lolit Solis the only thing that will ensure the peace in the country is the eradication of illegal drugs. The veteran talent manager who is well-known in the entertainment industry took to Instagram, to first express her thoughts on the migrant crisis. "Kung ikukumpara mo Salve iyon bayan natin sa mga nangyayari ngayon sa ibang bansa, parang matutuwa ka pa na mas maganda ang katayuan natin kaysa sa iba," she wrote. Lolit Solis then cited the news she has been hearing repeatedly: people who flee their respective countries to migrate, the heightened security at the Mexico border and the refugees who drown in the ocean because the countries they fled to would not accept them. She said hearing about these news makes one feel lucky that Filipinos have their own country — that they do not need to escape the country they are currently in for a better life and that they feel secure. "Iyon mga tumatakas sa bayan nila para mag-migrate, iyon binabantayan ang Mexican borders dahil sa dami ng gustong pumasok sa US, ang mga nalulunod sa dagat dahil ayaw tanggapin sa borders ng mga bansang gusto niang pasukin, you feel lucky na tayo may sariling bayan, na tayo hindi tumatakas, para mapunta sa ibang bansa, na tayo secure pa rin ang feeling sa loob ng bayan natin." Lolit Solis also added that there are indeed lot of things to be thankful with in this country, although he did not mention pres. Duterte but she was certainly referring to the present admin. The country's most popular talent manager, Lolit Solis also noted that God still loves us and perhaps our prayers are more powerful as she note that once illegal drugs will be eliminated in the country, we will be surely at peace.